Why should a business owner even worry about reducing website bounce rates to improve stickiness? There are several reasons, however it really depends on the site. Some sites provide specific short answers to a question posed by the reader. They will not stay long on a post or page. Other sites are providing product or service information or content that is informative. If it is well written and addresses the questions the reader is looking for, then they are likely to stay on the site for a longer period. Poorly written content or content that does not meet the needs of the reader and does not match the title will not hold readers for very long. Search engines tend to measure bounce rates and stickiness as indicators of how good a site is and will rank sites higher that have a low bounce rate! Quality content that addresses a reader’s interest area. 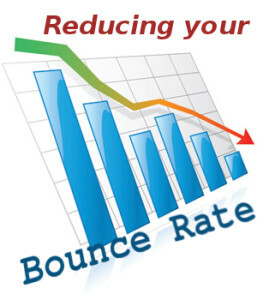 For more details about bounce rates and how they affect your time on page statistics, click here. 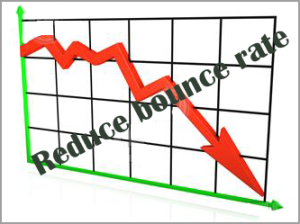 Many people might be wondering, what bounce rate is? Bounce rate is when someone surfing the Internet lands on your website, stays for only several seconds and moves on to another website. For people who are running a business having someone land on your website and not staying because they found that they did not like the page, your products or services is potentially lost business. If a potential come customer comes to your website, likes what they see and then browse other pages your chances of making a sale increases dramatically. Managing bounce rate and providing high-quality content are two ways of achieving this objective. We have put together a list of suggestions regarding how to reduce bounce rate, and increase the time spent on your website. Obviously each of these suggestions depends on the kind of service, products and website that you have. Here’s our list. Following some of these suggestions can improve your bounce rate, retain customers on your website for longer periods and improve the chances of converting them into paying customers. Not all of the above suggestions will apply to your web site. Each site is custom designed based on the product or services offered by a given company. Applying the correct ideas so that they make sense to the reader and add value to the readers experience is of the most importance. Part of retaining your customer on your web sit is creating an experience that is valuable to them and causes them to stay on your site because they find it helpful or interesting. For more help on these topics and others please feel free to give us a call or send us an email.